♥Magic Charms♥ Compatible with Pandora charms, Biagi, Troll and Chamilia European bracelets. Fit for both necklace and bracelet. 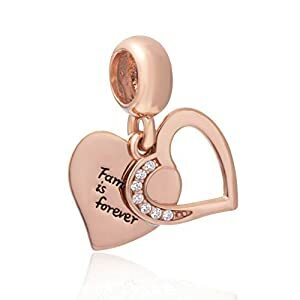 ♥Design Idea♥Family is Forever charm,we are family charm. ♥Measurement Attention♥Cherry blossoms charm hole size is Approximately 4.7mm, and the bead size is about 11.1*20mm, weight is 1.8g. ♥100% Satisfaction♥ Please feel free to contact us if you have any concern about this item. We will try our best to promise you an enjoyable shopping experience. Look forward to your 5-star review! Each European style sterling silver heart love chatm bead is made by high skilled worker, perfect processing, all handmade, fit perfectly on major brand European chains as well as our very own interchangeable bracelets, necklaces and bangles too.